JAK2 mutation and leukocytosis are strong predictors for thromboembolic events in patients with ET. Presence of JAK2 mutation and leukocytosis are strong predictors for thromboembolic events in patients with essential thrombocythemia (ET). In addition, morbidity and mortality are most related to thrombotic, vasomotor, and hemorrhagic complications in these patients during the first decade, a study published in Advances in Clinical and Experimental Medicine have shown. Researchers at the Wroclaw Medical University in Poland are reporting that changes in mean platelet volume can serve as an additional assessment marker when determining risk. They report that a simple test for prothrombotic state in patients with ET may benefit risk assessment .Long standing ET can progress to myelofibrosis or acute myeloblastic leukemia. In this current study, the presence of JAK2 mutation and leukocytosis were confirmed to be strong predictors for thromboembolic events in patients with ET. The study included 45 consecutive patients with ET (14 men and 31 women). The patients were aged 25 to 89 years (median, 62 years). A group of 45 healthy adults was used as a control. The researchers found significant difference when comparing blood parameters and hemostatic tests. 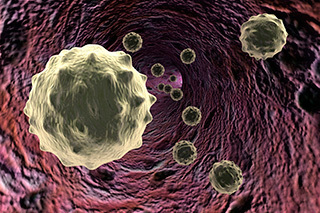 They found that leukocyte and platelet counts were significantly higher, but not hemoglobin level or erythrocyte count. In addition, the patients with ET had a higher mean platelet volume (MPV) compared with the control group. When the researchers compared the 2 groups they found that patients with ET who developed thrombosis had significantly elevated leukocyte counts, platelets counts, and MPV. The researchers confirmed that the occurrence of JAK2 mutation can be a strong predictor for thromboembolic events, and 17 of 21 patients with ET who developed thrombotic complications were JAK2 positive. 1. Prajs I, Kuliczkowski K. Predictive factors of thrombosis for patients with essential thrombocythaemia: a single center study. Adv Clin Exp Med. 2017;26 (1):115-121.